Once again, I intended to go out taking photos and ended up shopping instead. This time it was Kinokuniya‘s Foreign Book Sale which was held this past weekend in the Shinjuku Takashimaya department store. About two-and-a-half hours after getting there, I was loaded down with books, less loaded with cash than I was before, and hungry and not in the mood for pictures. I was particularly happy to discover that there were some Japanese-authored fiction among the offerings, and regret a little not picking up more than I did. Though I’m non-plussed on Haruki Murakami, on the basis of one novel (Sputnik Sweetheart) and comments from folks whose opinions I respect, it was hard to pass up the special edition of Norwegian Wood, published by the UK’s Harvill Press, which presents the work in its original red and green two-volume format. Especially hard when it was only ¥700, compared to its original sticker price of ¥3200 (£15.00 in the UK). The upshot of my calculations was that I spent exactly ¥10,000 for the above-listed 15 titles, which works out to ¥666 ($5.64) average per title cost. Compared with the books’ sticker prices, I saved ¥19,096 (or roughly $161). If I had bought the books new in the countries they originally came from (either the US or UK), my ¥10,000 still ended up being ¥12,797 less than what I would have spent. (Of course, if I was still living in the States, I wouldn’t have bought this many books at one time, nor would I have bought them new). I’m not exactly sure why Kinokuniya was selling off so many good books at bargain prices (I passed up a few wonderful coffee table photo/art books in the ¥1000 – ¥2000 range, which I now regret), nor if this sale is a regular occurrence. Interestingly, after I finished at the sale I went over to one of the Kinokuniya branch stores nearby (trying in vain to find one of Natsuki Ikezawa’s two books translated into English), and sitting on the shelves of their foreign books section were some of the same books, in the same editions, that I had just bought, with no mark-down of course. With 10 out of the 15 titles Japanese works or Japan-related, what should I have selected for my first read? Dashiell Hammett’s The Thin Man! You can buy books from amazon.co.jp – saves on shipping at least. They have some pages available in english now, but for those that aren’t I recommend opening up the usual .com page and comparing, as the layouts are identical! I had the used bookstore thing really bad before I came to Japan. I had to unload several crates of books at the local library (they have a fundraising used bookstore) before I came to Japan. I got The Devil’s Dictionary at Maruzen (Japan’s first kabushiki-gaisha, or stock-issuing corporation) in Kyoto. They have a free-standing rack of poetry titles, single Shakespeare plays, Wordsworth, Beowulf, English Lit. class kind of stuff, for �300 each. When I was in San Francisco a few years ago, I went into the Kinokuniya in Japan Town (kind of a Mexican version of Japanese stonemasonry) and there were a whole bunch of Japanese in there doing tachi-yomi. That was a hoot. 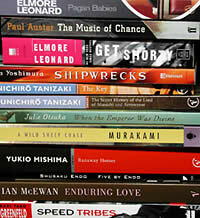 I think Haruki Murakami is fab – I’ve been caught up in every one of his works so far. If you haven’t had the chance read his non-fiction work Underground, about the Aum gas attacks – very interesting stuff. Use Speed Tribes to prop up a wonky table – that’s about all it is good for. A collection of old stereotypes thrown together with a slick title. Hi… You should read Mishima’s Spring Snow before Runaway Horses. yes, Kinokuniya was one of my favorite haunts during all the years I lived in San Francisco, lord knows how many books I bought there. Of course, there I experienced the opposite problem to what I have now…that I wanted all these books published by Kodansha or the Japan Times etc. and I had to pay through the nose for them!